Happy First Day of Spring. 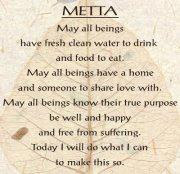 Today is Metta Prayer Day. I was introduced to these prayers from friends in Newtown, Ct. The message of Metta Prayers have appeal to people of all different faiths. Take a moment from your first Spring day and say this pray. It is only by holding a vision for change... that change will happen. Blessings to you and Happy Spring! Thank you for this Diane. I will share on my blog today as well. Beautiful message. Thanks Dan... I think it is a wonderful vision to hold. These are wonderful and world encompassing things we should all pray for, no matter the faith. Thank you for the reminder to pray for more than just what I see around me. Yes, I tend to get caught up in praying for just what I and my family need. There are a lot of people who need so much more then I could ever imagine.